Planning on buying a new TV? Here we give you some tips on the most important things to consider before making up your mind. You get used to the size of your new TV pretty quickly, so choose a size bigger than you initially imagined, especially if you are looking for a model smaller than 55-inch. Today it’s common to choose a model that is at least 55-inch, which is a good size if you want the greatest possible performance and image quality for your money. Here you will find all TVs from 52 to 70 inch, and here are all TVs from 71 inch and upwards. Ensure that the TV you purchase is compatible with both 4K and HDR10 - preferably HLG as well. When buying a TV, it’s important that it supports both 4K and HDR. 4K means that the panel can display 3 840 x 2 160-pixel image resolution, four times as many pixels as full HD, and provides a sharper, more detailed image. The larger TV you choose, the more important it is that it can handle 4K resolution. HDR stands for "High Dynamic Range", and provides a brighter image with more vibrant colours. It also makes it easier to highlight details in both bright and dark areas of the image. To get all the benefits that HDR provides requires that the TV has support for it. SDR: SDR stands for "Standard Dynamic Range" and is normal image quality without the benefits of HDR technologies. HLG: HLG stands for "Hybrid Log Gamma" and works with older TVs without HDR support. HLG is not as good as HDR, but provides better picture quality where HDR is missing, for example, in some TV broadcasts. HDR10: Is the standard that all HDR-capable televisions can handle today. You get a brighter, more detailed image and more powerful colours compared to SDR. HDR10 +: HDR10 + is a further development of HDR10, which was developed by Samsung. With the support of so-called dynamic metadata, each individual frame and scene can tell the TV how to present the image in the best possible way. 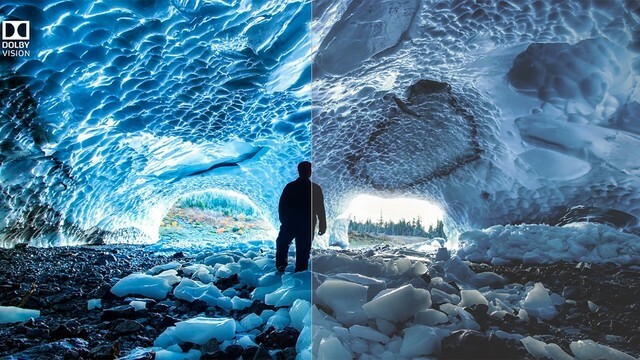 With HDR10, it is the same HDR setting for the entire image material. Dolby Vision: Dolby Vision is the best option today, but only available on OLED TV. Dolby Vision provides a brighter, cleaner and more colourful image than HDR10. The technology can also show more details in bright and dark sections of the image. Here you will find all TVs with 4K resolution and here are all televisions with HDR. When choosing your new TV, you need to think about what kind of panel it should have. It's the part that actually shows the image you're watching. Today, there are mainly three types: LED, QLED and OLED. All three provide excellent picture quality on the right TV model, but they differ a lot. In short, if you want a lot of television for your money, and good picture quality, LED goes a long way. If you want that little extra in the higher price range, then you should look for QLED or OLED. LED: LED stands for "Light Emitting Diode" and is today the most common panel type. It’s a further development of the LCD technology with LED lights for backlighting. LED is the cheaper variant of the three types, with good features at reasonable prices. Here are all the TVs with LED. QLED: QLED is basically a LED panel with Samsung's own Quantum dot technology. A further development of LED for better colour reproduction thanks to a special colour filter between the LCD panel and the LED illumination. QLED is more expensive than LED, but provides better colours and higher brightness. Here are all the televisions with QLED. OLED: OLED stands for "Organic Light Emitting Diode", and is a panel type that is completely different from both LED and QLED. Each individual pixel can be switched off independently of the others, unlike LED and QLED, which can only tune down individual zones with pixels. OLED is the most expensive option with the best blackness and viewing angles. However, the brightness is not as good as on QLED. Here are all the TVs with OLED. The idea of a curved TV design is that you will have a more surrounded experience with a greater sense of depth in the picture. You also get the feeling of a broader, more cinema-like image with higher contrast. At least, that’s what the manufacturers are hoping to be able to offer with their curved televisions. In order to take advantage of the curved design, you have to sit within a certain distance of the TV and straight in front of it. 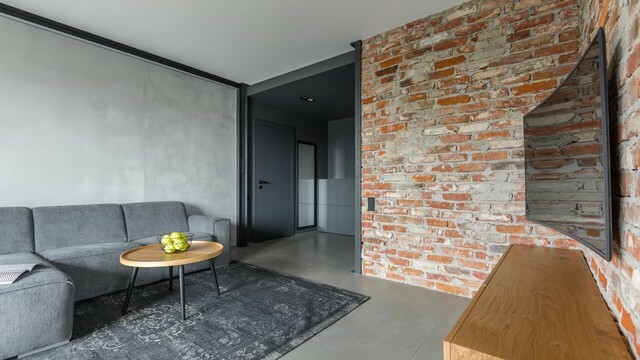 If you have a wide space between seats in front of the TV, they can suffer reduced picture quality and increased reflections from various light sources. Here you’ll find all the curved televisions. Don’t just go by the manufacturers' high numbers and marketing. Films, sports and games often have very fast movements and therefore it is important to have a TV that can display a high frame rate. The more pictures the TV can display every second, the less shaky the image is perceived, and you get better sharpness during fast motion. At least 120 hertz is recommended to avoid slow and shaky pictures. Many manufacturers use their own variants of interpolation to increase the framerate beyond the panels native frequency. Interpolation means that the TV makes their own image frames and inserts them between existing ones. When done fast enough, your brain is fooled into believing that the video is sharper than it actually is. Sound quality differs greatly between different TV models, and whatever you choose, it's always better with a separate audio system, like a sound bar, stereo speakers or a complete home theatre system. 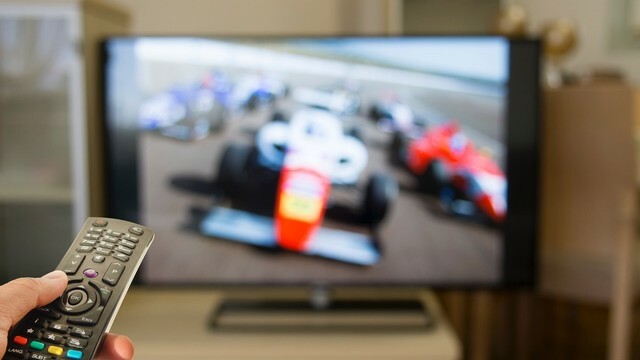 Today's televisions are so thin that manufacturers are having trouble implementing a good-sounding system with full sound. Perhaps the easiest thing is to buy a soundbar placed in front of, or under, the TV. A soundbar is an oblong box with several speakers on the inside for an immersive sound and a so called center in the middle for speech. A subwoofer is often included, that you place in the room for the extra low tones, such as explosions and the like. 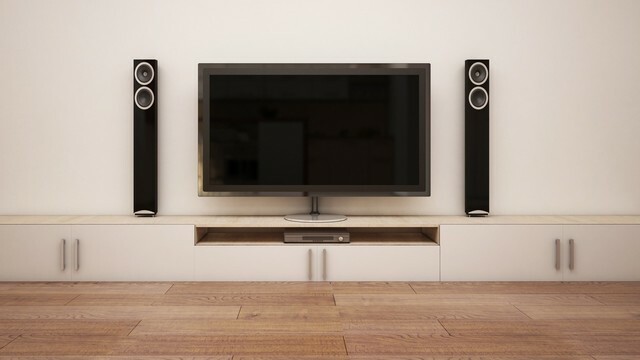 It’s important to know how many speakers you want when choosing an audio system for your TV. For surround sound, at least three speakers are required, two behind you and a subwoofer. If you want to listen to Dolby Atmos or DTS:X, which is particularly good for films, then two more speakers are needed in the ceiling; alternatively floor speakers with upward speaker elements. Here you’ll find soundbars to complete your TV with. If you want to listen to Dolby Atmos or DTS:X, you can find soundbars for it via each link. Basically, all newer TVs have smart features that allow you to surf, stream films, and play games directly via the TV. They have built-in applications, very similar to how it works in your mobile phone, and sometimes both webcams and a microphone for call services. The different Smart TV solutions differ in function and appearance, so please try them out in the shop before you buy. 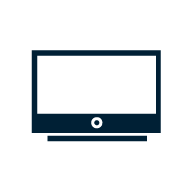 The older TV you have, the less likely it is that it will be compatible with new features and updates. It also means that the applications will no longer receive updates and eventually will not work. 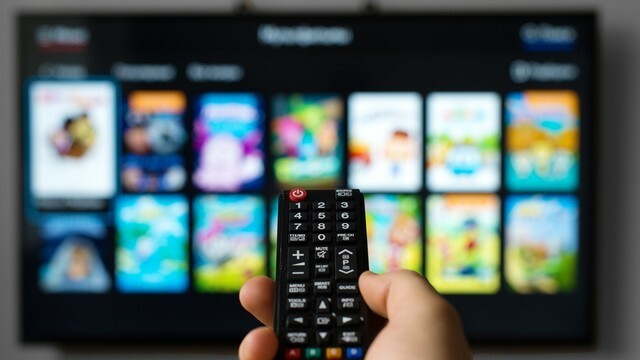 If you intend to invest in a TV that will last for many years, it's important to buy one as new as possible, preferably in the top price range. Here you'll find TVs with smart features.